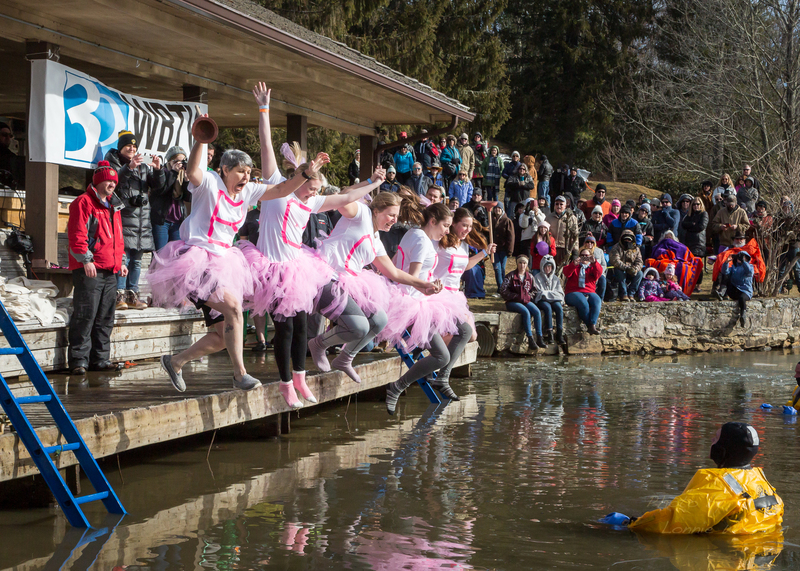 Though it was nice weather for January with the sun shining and no snow or ice, everyone braced themselves for the cold as crowds gathered for the Polar Plunge on Saturday morning. “The water was right at a little below 30 degrees. They had to break the ice two or three times. It kept refreezing,” said Hardin, executive director of Blowing Rock Chamber of Commerce. John Carter, WBTV news anchor, covered The Polar Plunge in Chetola Lake, which is one of the highlights at WinterFest. Chetola started cutting through the layer of ice well in advance, so Plungers felt the full impact. Plungers gathered in the indoor pool area at 9:45 a.m. for a safety speech, and then the party started with the annual march to Chetola Lake. Participants began jumping at 10 a.m. The Golden Plunger, awarded each year to the best costume, was awarded to Jess Greg, who was the Statue of Liberty, and Uncle Sam. Proceeds from the event are still being calculated, but 50% of net proceeds benefit local charities Western Youth Network and Hospitality House.